Wanna know how to make fluffy pancakes from scratch? Add Greek yogurt! 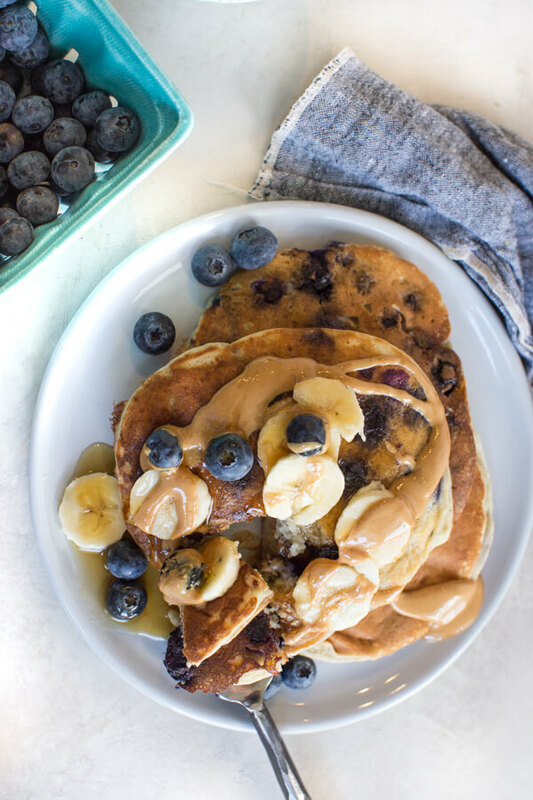 Gluten free Greek yogurt pancakes recipe made with almond flour, banana and blueberries. I’m obsessed ya’ll and can’t wait to tell you about it. Moist and fluffy pancakes from scratch are in the house! And there are so many reasons to be obsessed with these delicious cakes and one of the things I love about this recipe is that it uses almond flour, which is a staple baking flour in my kitchen as of late, for many reasons. So if you want to know how to make pancakes from scratch using almond flour, keep on scrolling. I’m not afraid to admit that the pancake obsession runs deep you guys. 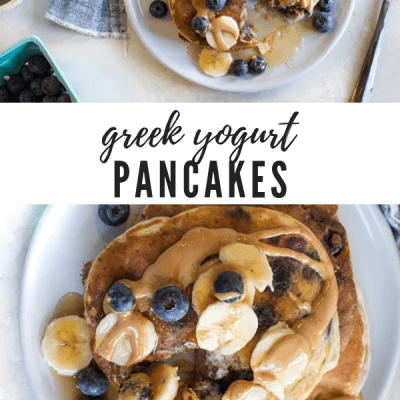 And if you don’t believe me, check out my pancakes archive on the blog – soooo many pancake recipes including more protein pancakes with greek yogurt! Nutty flavor. If you’re a fan of nuts like me, you’ll appreciate the nuttiness of almond flour. By no means is it an overwhelming nutty flavor but it’s just enough to heighten the flavor of whatever you’re baking. PS – almond flour is da bomb as a coating for chicken tenders! Gluten free. If you didn’t know already, the hubs eats gluten free, thus I do most of the time. I typically buy almond flour in bulk because we go through it like cray cray. I’m always on the hunt for yummy tasting almond flour brands and Costco’s Kirkland and King Arthur are on the top of my list. Greek yogurt! My secret to the best fluffy pancake recipe is 100% in the Greek yogurt. The creaminess factor of the yogurt is what fluffs these pancakes up and makes them light as a cloud! Whisking! Adding air into the batter with a whisk also helps creates the fluff factor and gives you the best fluffy pancake recipe. Leavening! Don’t skimp on the baking soda and baking powder. These help to lift the pancakes and keep them oh so fluffy. Hot griddle or non stick skillet! To get pancakes with lift, you need to start with a hot skillet. If the skillet hasn’t heated the pancakes won’t get that initial lift, and the pancakes will fall flat. How to make fluffy pancakes with Greek yogurt? 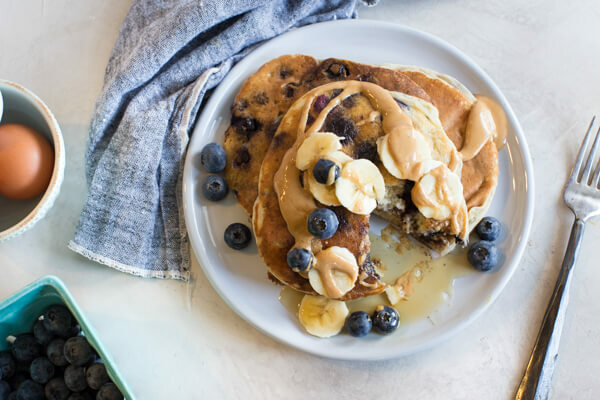 These blueberry pancakes are what I like to call a one-and-done recipe because you only need one mixing bowl to assemble these babies. And how to make fluffy pancakes with greek yogurt is so easy peasy – grab a mixing bowl and your whisk! Step 1. Grab your favorite mixing bowl and get to whisking, mama! Mash your ripe banana and add in your fave Greek yogurt, eggs, and vanilla. WHISK WHISK WHISK! Step 2. Gather your dry ingredients and add the flour, baking powder, and baking soda to wet ingredients and… you guessed it, WHISK AWAY! Step 3. Add milk to mixing bowl and you’ve reached the final whisking stage! You’re almost ready to devour these fluffy melt-in-your mouth pancakes, mama! Just fold in blueberries, melt some butter and you’re on your way to homemade fluffy pancakes! Pancakes are one of my all time favorite breakfast meal prep go to’s! I can’t think of anything easier than making a batch of pancakes and storing them in the fridge and/or freezer to have on hand for busy mornings. 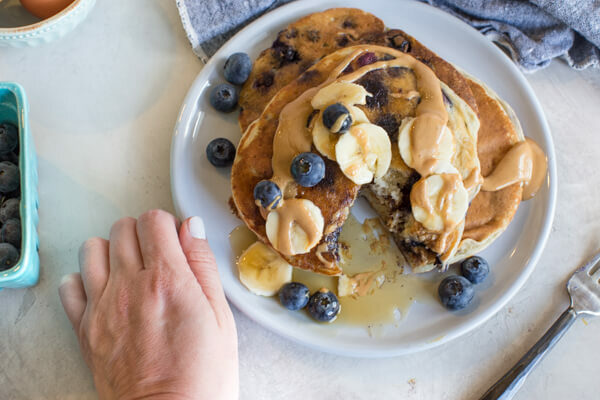 So if you struggle with eating a healthy breakfast during the week or the mornings feel rushed, make a batch of these fluffy pancakes ahead of time. So here’s what I usually do when I make protein pancakes with Greek yogurt from scratch. Freeze pancakes by placing them on a baking sheet and placing in freezer until frozen and then transfer frozen pancakes to freezer bag to keep fresh for up to 3 months. Protein Pancakes with Greek yogurt are all you need in life! Do you have a favorite way that you enjoy your pancakes? Let’s chat because I’m always looking to change up my topping game! 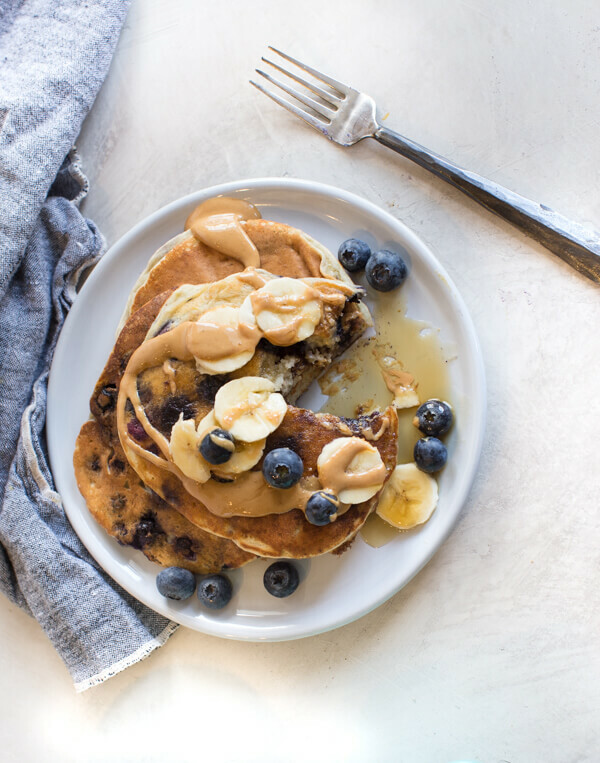 Currently, my personal fave way is bananas and blueberries and a drizzle of creamy CASHEW BUTTA and that maple syrup… oh and a little dollop of soft salted butter on top of every layer of pancakes for legit melt in your mouth pancakes! So tell me – what’s your favorite way to enjoy pancakes?? Comment below so we can chat alllll the topping ideas! 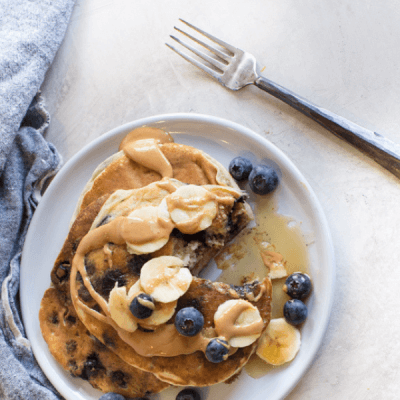 Enjoy these protein pancakes with greek yogurt any time of day! Because breakfast for dinner is one of the best things since sliced bread IMO. 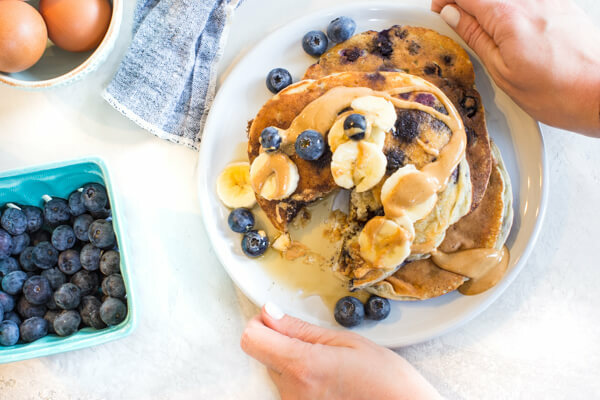 I’m always down for fluffy pancakes from scratch especially these Greek yogurt blueberry pancakes AKA homemade fluffy pancakes. Fiber. Let’s all go ahead and thank almond flour for being such a versatile flour that offers lots of fiber. Thanks to almond flour, these pancakes have a whopping 3 grams per pancake! Gluten Free. And if you’re gluten free for dietary reasons, you’re in luck! 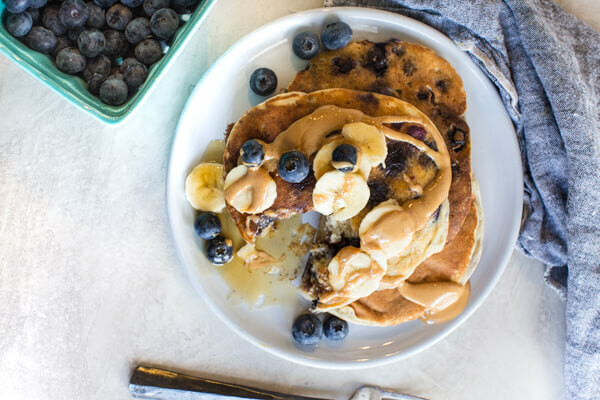 Don’t deprive yourself of delicious pancakes – check out the many gluten free pancake recipes on the blog! If you want to know how to make fluffy pancakes: Greek yogurt is the answer! 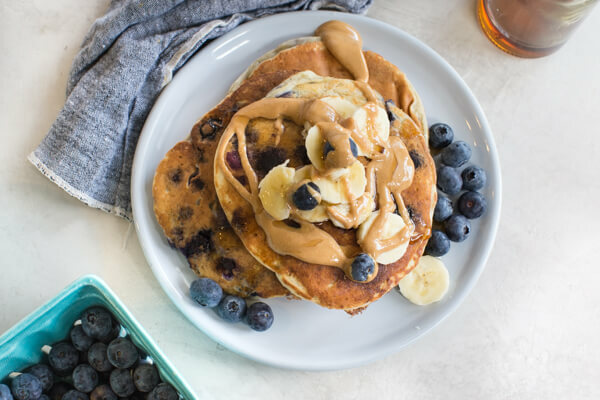 This gluten free Greek yogurt pancakes recipe is made with almond flour, banana and blueberries and will totally knock your socks off! In a large bowl, mash banana and stir in Greek yogurt; whisk in eggs and vanilla. Whisk milk into batter and carefully fold in blueberries. In a large non stick skillet, heat butter over medium heat. Once pan is heated and butter begins to melt, spoon batter onto pan; cook until golden brown on one side and bubbles form on uncooked side; flip and cook until golden brown on both sides. Note: As you cook greek yogurt pancakes it’s important to adjust the temperature, often you will need to turn temperature down to medium low after the first couple pancakes. 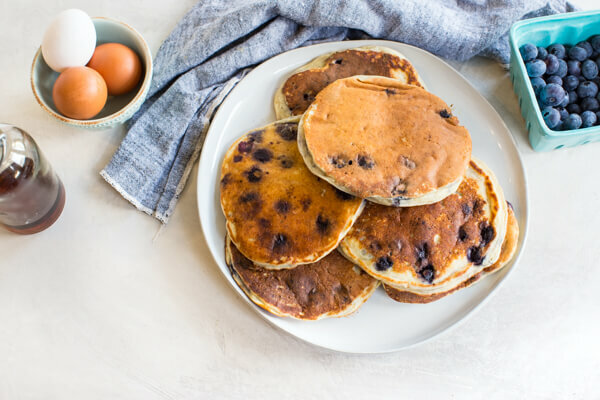 You Blueberry pancakes look amazingly fluffy and light! I can’t wait to make these this Sunday. I bet my husband falls in love with this recipe. Saving to make later! How many serves would this be? I also believe I have a gluten intolerance, what type of DR does the testing? A pcp? Anyway I have been trying to limit my gluten just in case. I like Almond and brown rice flours. Check out comfybelly.com and elanaspantry.com if you haven't already they use mostly nut flours. good luck! Hi Meredith! Thanks for stopping by and leaving a comment. As an RD, the food sensitivity testing is something that I can order. 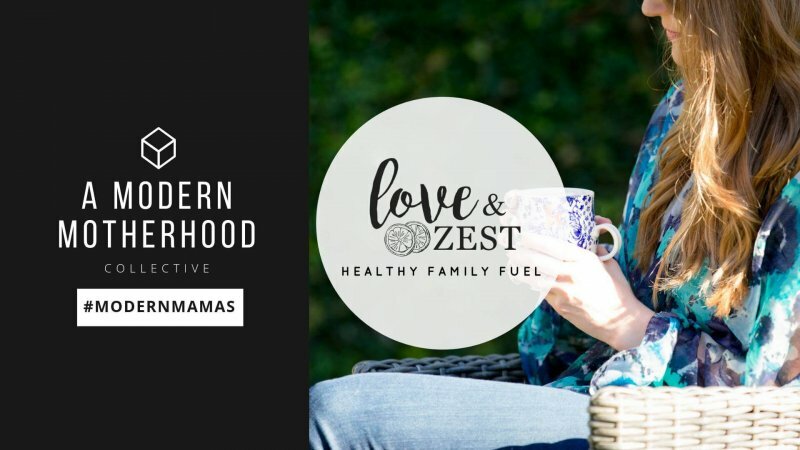 Contact me loveandzest@gmail.com if you'd like to talk out the details. Thanks for the flour suggestions and GF resources– those sound really good. I haven't done much with almond flour but I hope to in the future! You photos are gorgeous! This recipes is definitely one I will have to try out on my kids, I know they'd approve! I haven't done much gluten free baking and am curious to see what kinds of things you come up with now that you know about your sensitivity. I appreciate that so much!! I tried out this recipe with garbanzo and fava bean flour (minus the walnuts).. they were more dense and savory but we still ate them up! These photos are simply stunning. I am sorry to hear about your gluten intolerance though. That must be tough. I used to personal chef for someone with celiac disease and had great luck with brown rice flour. Now there are so many great flours available to blend. Have you experimented with the pre-mixed ones yet? I haven't had great luck with 1:1 substitutions. Thanks Katie!! 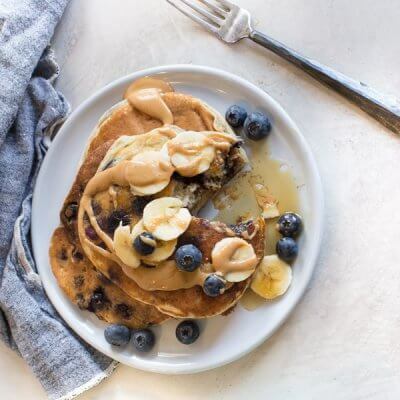 I'll have to try brown rice flour, I really haven't played around much with flours.. except I did do these pancakes last weekend with 100% Garbanzo and Fava flour.. they were just more dense with a little more of a savory flavor– I have been buying brown rice bread! We just had these for breakfast with some of our home made maple syrup. You got two thumbs up from me and my 6-year old who did the banana mashing. They were really moist. Great recipe really. My daughter was so confused when I used butter on the griddle. She was like woah Mommy never uses butter like that! Ha ha. I didn't tell her that a RD said it was ok:) Another thought I had about the flours, is that you could use a blend with some ground nut flour too. Like part brown rice and part almond flour (omit the chopped walnuts.) Have you worked with nut flours yet? YUM! That is hilarious about the butter! I just put it on the pan for the first pancakes and it lasts for the rest.. I can't imagine not using butter on the griddle 🙂 I haven't used any nut flours or a blend yet, but I'm def going to have to try out your suggestion!! THANKS!! Wait… what? I didn't know this!! When/where did you have the testing done. I'm dying to know more! 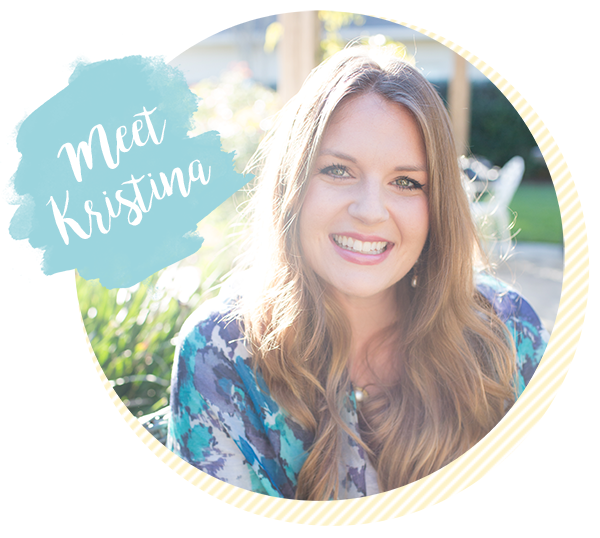 Do you know Gretchen from Kumquat blog? 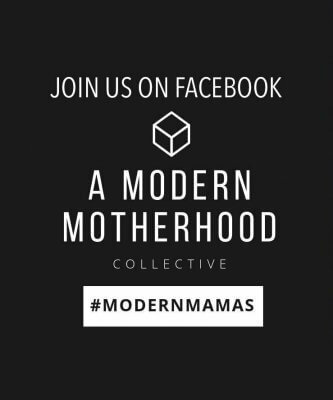 Definitely start following her blog if you don't already. She is the gluten-free queen. I know Regan! It's a relatively new discovery. We do food sensitivity testing at the office, and I was lucky to get mine tested a few weeks ago! I will be posting a blog on Monday detailing it all. Of course I know Gretchen for her lovely photography, and I will need to delve more into her recipes as I experiment with new flours!